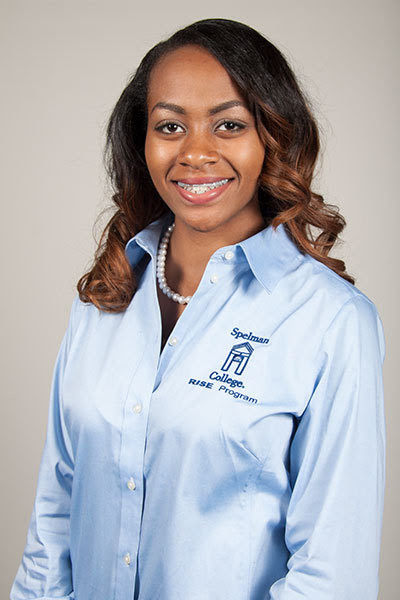 Leiana-Mejoi Griffith is a sophomore, Psychology major, Management & Organization minor at Spelman College. She currently works in Dr. Valerie Taylor’s lab in the Psychology Department of Spelman College. The research is focused on stereotype threat, identity threat, and their affect on interpersonal interaction. Previously, Leiana-Mejoi has researched at Emory University School of Medicine in Dr. Ping Chen’s lab in Cell Biology Department. She worked alongside Dr. Cristy Gilchrist examining the role of protein trafficking in the establishment of planar cell polarity (PCP) using the inner ear as a PCP model. Upon graduation, Leiana-Mejoi plans to pursue a PhD in Psychology to continue her research.